It’s a battle between nausea and tears, nausea and tears, nausea and tears, over and over again. I try not to think about specifics of the violence. I think about what I can do to help, but what little I can do feels helpless. And then I get really, really sad for them. I don’t want to see football highlights on TV news. I don’t want to hear political opinions about gun violence. They feel hollow, useless, and detached. I wonder about the sickness in this man’s head, what would lead to premeditate an attack like this. The plotting. The acquisition of machine guns. The belief that shooting hundreds of people would lead to pleasure, solve his problems. One man’s sick desire can lead to countless people’s gruesome suffering. I’ve spent a thousand nights on the strip with the trust that no monster would come along and exploit the vulnerability of the crowds. Despite having been close to a half dozen minor shootings, I insisted on believing we were protected from an outright massacre. I can’t imagine what the families of these victims are going through, what life will be like for those survivors who did not have the luxury of distance from the bullets. I want us all to go back in time, back before any of this could ever have been possible, and make the necessary changes to the world that seem, now, too late to make. I don’t have a lot of hope. But there has to be hope, right? There just has to be. I’m sorry, I’m a bit out of sorts. Thank you for listening. 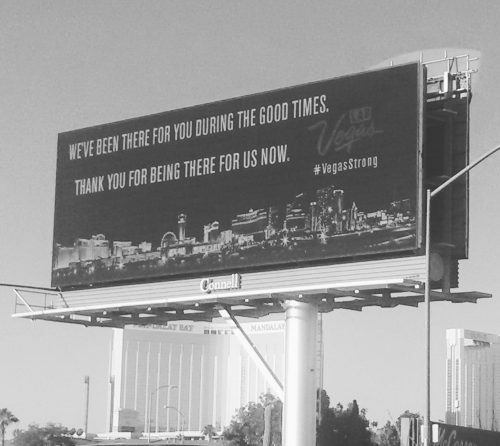 Donate to the victims of the Las Vegas shooting. Posted in Tourist Information and tagged Vegas. Bookmark the permalink. Trackbacks are closed, but you can post a comment.